In 1993, the web was still in its infancy, with about 14 million users and a hundred websites. Pages were static but there was already a need to produce dynamic content, such as up-to-date news and data. Responding to this, Rob McCool and other contributors implemented the Common Gateway Interface (CGI) in the National Center for Supercomputing Applications (NCSA) HTTPd web server (the forerunner of Apache). This was the first web server that could serve content generated by a separate application. Since then, the number of users on the Internet has exploded, and dynamic websites have become ubiquitous. When first learning a new language or even first learning to code, developers, soon enough, want to know about how to hook their code into the web. Since the creation of CGI, much has changed. The CGI approach became impractical, as it required the creation of a new process at each request, wasting memory and CPU. Some other low-level approaches emerged, like FastCGI](http://www.fastcgi.com/) (1996) and mod_python (2000), providing different interfaces between Python web frameworks and the web server. As different approaches proliferated, the developer’s choice of framework ended up restricting the choices of web servers and vice versa. To address this problem, in 2003 Phillip J. Eby proposed PEP-0333, the Python Web Server Gateway Interface (WSGI). The idea was to provide a high-level, universal interface between Python applications and web servers. In 2003, PEP-3333 updated the WSGI interface to add Python 3 support. Nowadays, almost all Python frameworks use WSGI as a means, if not the only means, to communicate with their web servers. This is howDjango, Flask and many other popular frameworks do it. 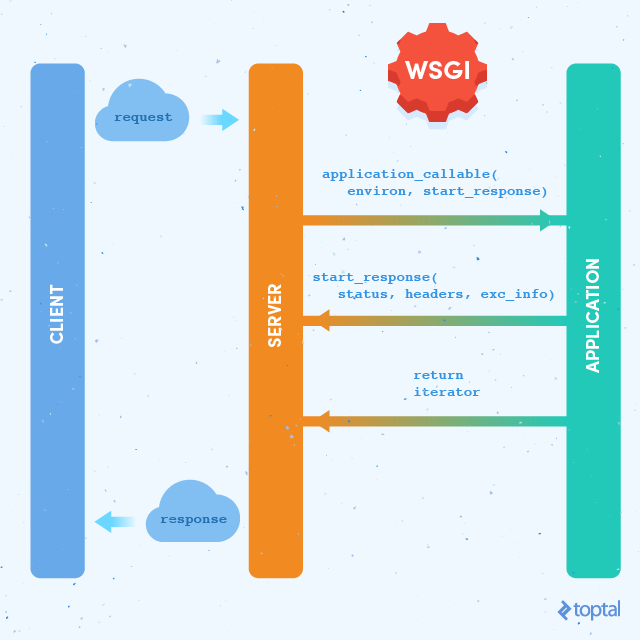 This article intends to provide the reader with a glimpse into how WSGI works, and allow the reader to build a simple WSGI application or server. It is not meant to be exhaustive, though, and developers intending to implement production-ready servers or applications should take a more thorough look into the WSGI specification. WSGI specifies simple rules that the server and application must conform to. Let’s start by reviewing this overall pattern. In Python 2.7, this interface wouldn’t be much different; the only change would be that the body is represented by a str object, instead of a bytes one. Must be a callable with environ and start_response parameters. Must call the start_response callback before sending the body. Must return an iterable with pieces of the document body. As you may have noticed, the start_response callable returned a write callable that the application may use to send data back to the client, but that was not used by our application code example. This write interface is deprecated, and we can ignore it for now. It will be briefly discussed later in the article. Another peculiarity of the server’s responsibilities is to call the optional close method on the response iterator, if it exists. As pointed out in Graham Dumpleton’s article here, it is an often-overlooked feature of WSGI. Calling this method, if it exists, allows the application to release any resources that it may still hold. The environ parameter should be a dictionary object. It is used to pass request and server information to the application, much in the same way CGI does. In fact, all CGI environment variables are valid in WSGI and the server should pass all that apply to the ……continue reading….. Thank you for reading my blog , the reference is taken from one of the article that was published by Leandro Lima on Toptal. This entry was posted in Python Programming and tagged Interface for Python, server application interface for python, server application interface in python. Bookmark the permalink. I am very satisfied with your site and very impressed with your information and also I like your site a lot. You made a good site it’s very interesting one. You did a good job on this topic. Thanks for sharing the best posts they very help us.